Showcasing a global spectrum of top-awarded projects, companies, people and technology leading visitor attractions and providing a forum for peer discussion, the annual Summit of the Themed Entertainment Association attracted record attendance with some 300 delegates for Day One and 550 for Day Two (April 5-6). 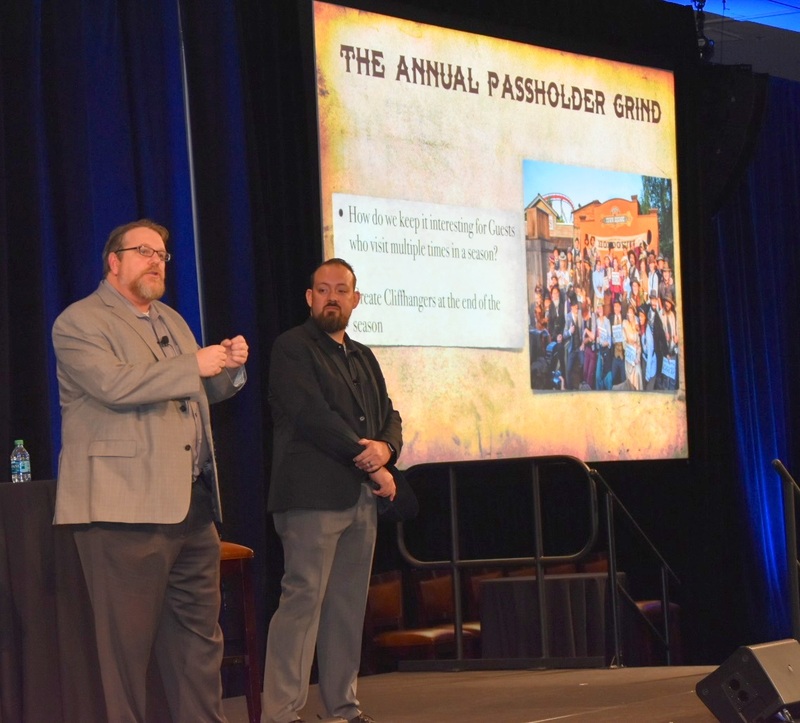 The meetings convened at Disneyland Resort in Anaheim as part of TEA's big weekend of events, culminating in the TEA Thea Awards Gala presented by Chimelong, April 7, which also welcomed a record crowd of more than 800 celebrants. taking place at Disneyland Resort in Anaheim, CA USA. Global top entertainment operators, creatives, brand managers and leading IPs - including Joe Rohde (Disney), Sir Richard Taylor (Weta Workshop), Jonathan Linn (Universal Parks & Resorts/DreamWorks Animation), Chimelong Group (China), Smithsonian, Dubai Parks & Resorts, Knott’s Berry Farm, de Efteling, Jameson, Marvel (Guardians of the Galaxy), AVATAR and Frozen were among those represented. Photo at top: Three of TEA's four Division presidents welcome guests to the 2018 TEA Thea Awards Gala: Matt Barton (Europe & Middle East), Melissa Ruminot (Eastern North America) and Tricia Rodriguez (Western North America). The Gala was produced by Ryan Miziker and Miziker Entertainment. 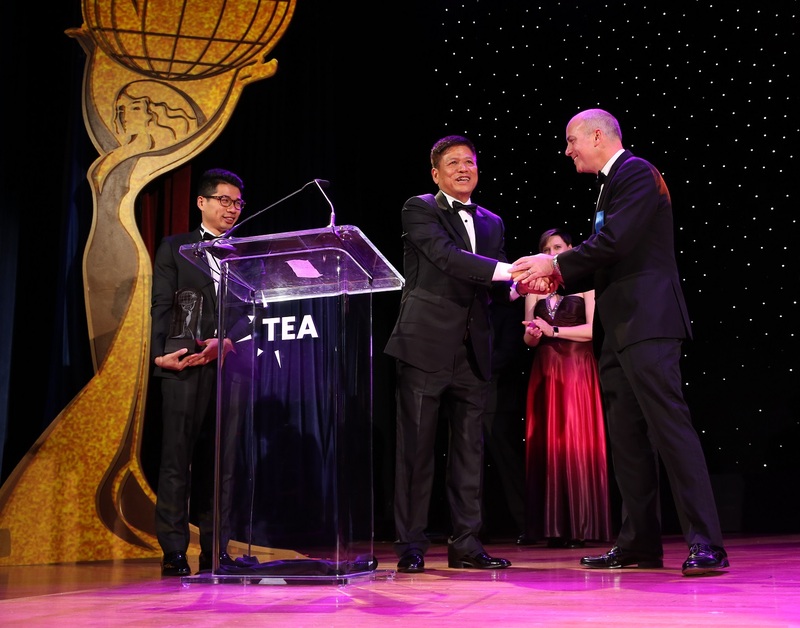 TEA Thea Awards Gala, April 7 at Disneyland Resort. 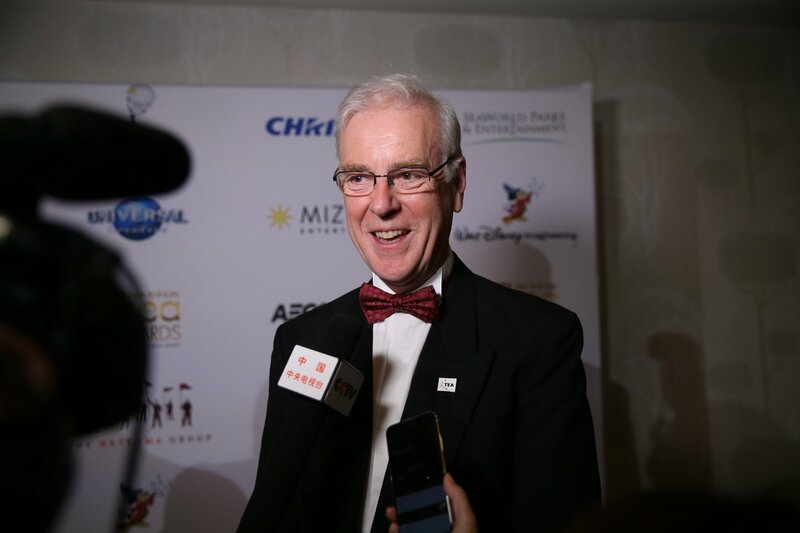 Chairman, Chimelong Group, presenting sponsor of the Gala. A mere quarter century ago, there was no Thea Awards and there were no official project credits for the industry. The work of designers, architects, artisans, producers, technical specialists and creatives of all kinds, the best of their kind putting together unique, influential, one-off projects went largely unsung. Moreover, there was no way to verify claims. Buzz Price Thea Award for a Lifetime of Distinguished Achievements. The membership of TEA represents a talent pool that all major entertainment operators draw upon, and it is common practice for even the biggest operators to supplement their internal team with an external team handpicked for the project's needs. 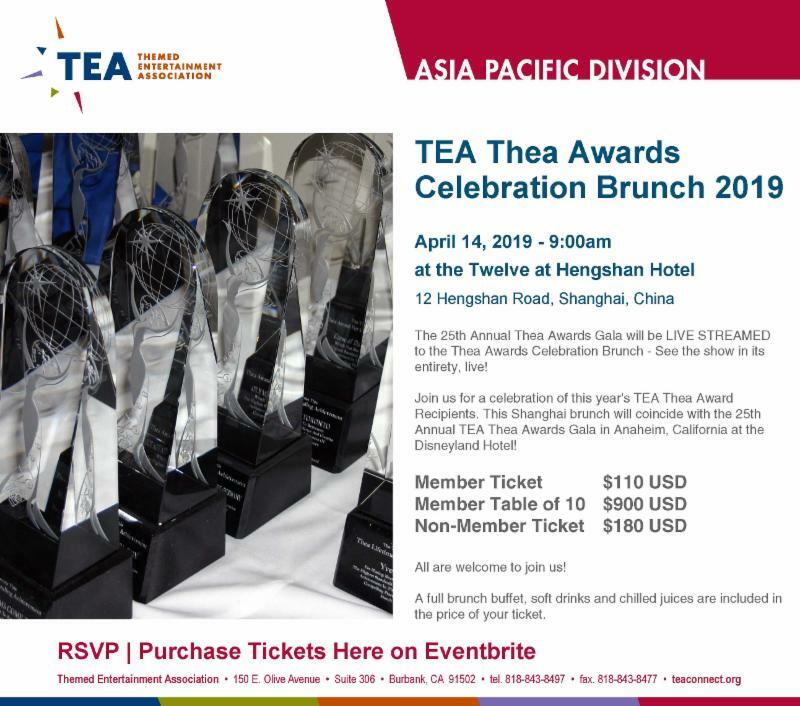 The TEA Thea Awards have addressed this in the celebration of themed entertainment's finest and the publication of official credits for each awarded project. Global attention is focused on these projects and they earn acclaim not just as guest experiences but as creative accomplishments. 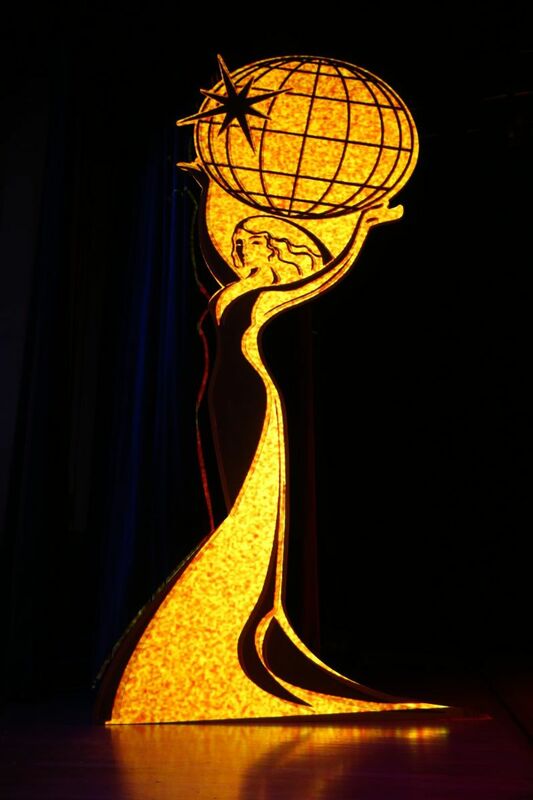 The Thea Awards are not a suspense enterprise – the projects, people and technologies selected by the committee are announced in November, several months before the big weekend takes place, with information about the projects and what makes them breakthrough, so that there's a significant window for attention. for the National Museum of African American History and Culture. The award was presented by celebrated actress Debbie Allen (right). The big weekend is not just an awards party. 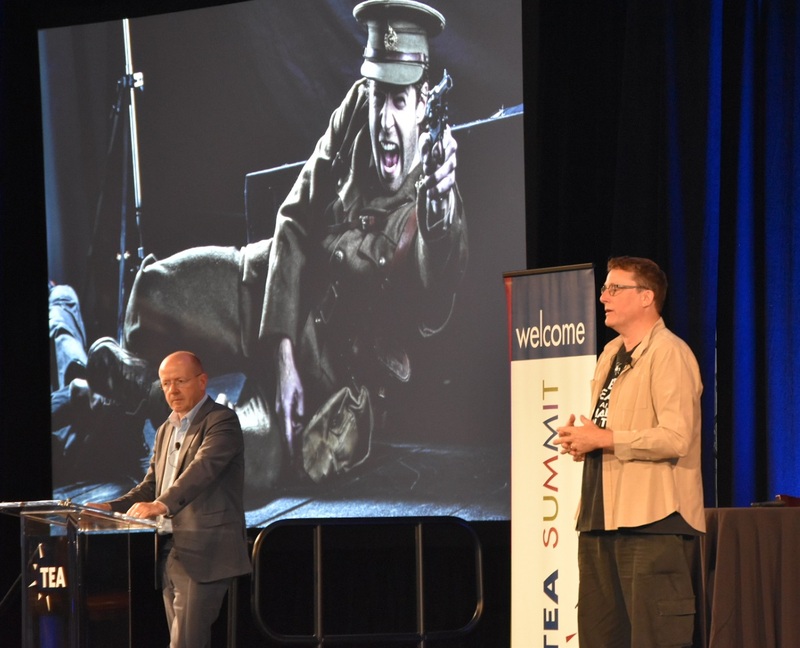 The recognition of the TEA Thea Awards recipients extends with the TEA Summit, which features showcases of each awarded project, person or technology - each breakthrough accomplishment - in a peer discussion, pulling back the veil on the project process. 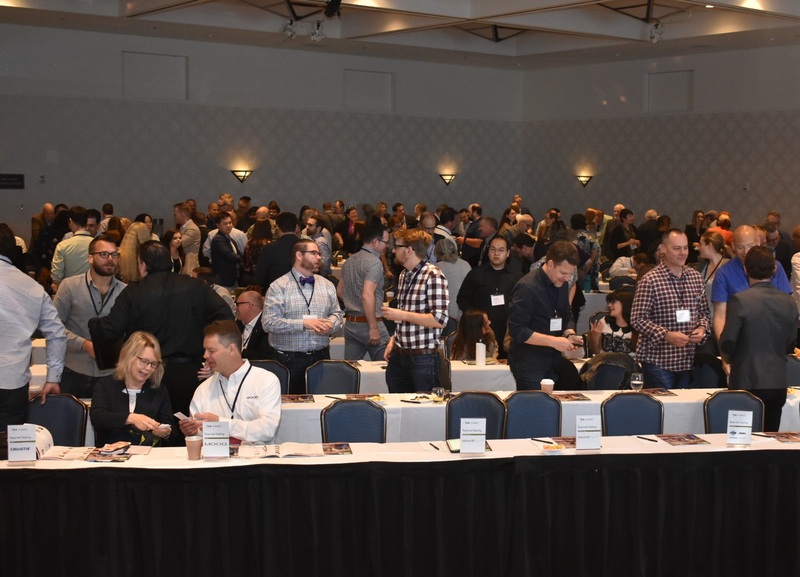 The TEA Summit case studies enable the entire industry to benefit from the education and networking opportunities. These events are held at Disneyland Resort in Anaheim, a seminal hub of the entertainment industry. "If you lead with technology you’re going to be obsolete within 6 months, you have to lead with a good story, don’t just jump on the bandwagon." "The secret sauce of what we do is the ability to connect people one on one, and the more we live in a world where we are looking at screens, we are more desirous of that thing that will connect us. The shared experience that takes us out of our everyday reality is going to be even more important going forward, the feeling of being alive and connecting with other people." welcomed a full house and a record 550 delegates. "Cedar Point's first ride was the Switchback Railway. It was 25 feet tall, had a speed of 10 mph, and people waited 3 hours to ride it." At left is Dale Su of Chimelong Resort. "Parades are really moving shows, each unit is a scene in a story. 'Can we really just make everything out of programmable lights? Let’s do it.'" "Kids learn by doing. Adults search for instructions; kids just do"
"Substance must take precedence over form; technology is just a tool; our visitor must be spectator and actor." "You couldn’t tell the story of soldiers with pathos by telling the story of a whole army. If you pluck out individuals and tell it through their own voices, they do have a way to speak to you across time." "We will farm nothing out unless it’s absolutely imperative. We just quietly discuss what we think is the innovative methodology to achieve the desired result and we turn to the talented people around us." "People come out at the end drenched in the subject matter and having become one with the content." 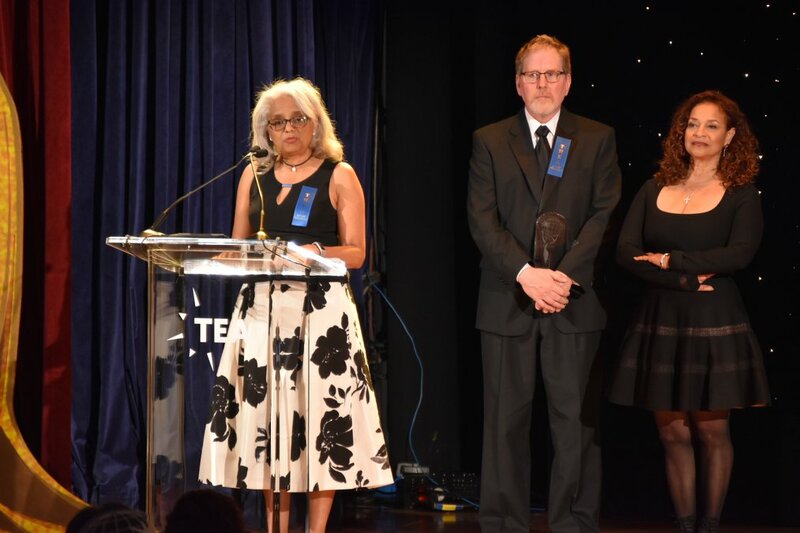 Thea trophies bestowed for Disney projects at the 2018 Gala. He is surrounded by colleagues and team members from WDI. Michel Den Dulk: "Once we had Elsa’s 'Let It Go' moment placed, we could design the rest of the ride. We started with the middle." John Mauro: "The countdown clock here feels like the timeline for the attraction." Claire Weiss: "We wanted to start you with the ‘Boo!'" 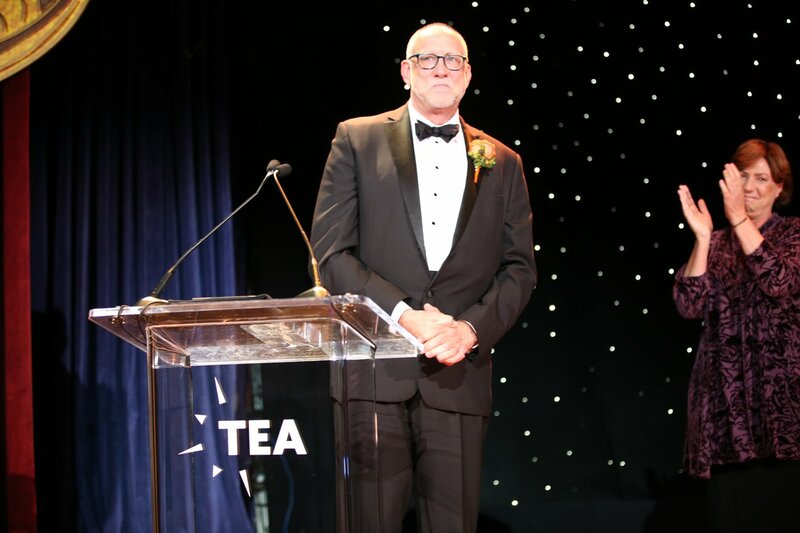 which was honored with a 2018 TEA Thea Award. Joe Rohde: "There is no exposition once the ride begins, that’s got to be handled before you pull the trigger, then there is nothing but laughing and screaming and slapstick... The number of possible yeses is really quite wide providing you’re trying to achieve this immaterial goal... We’re trying to make the completely imaginary world of Pandora and that is exceedingly difficult and thank God I didn’t have to do it all alone." Mark Lavine: "It’s about you the guest, about experiencing something amazing that becomes your story." to the sponsors and the team! See below. 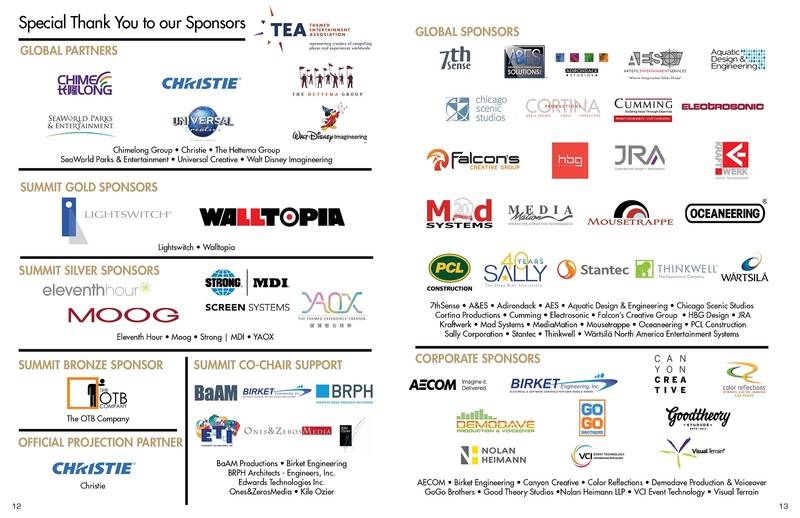 2018 TEA Summit Sponsors - Thank you! 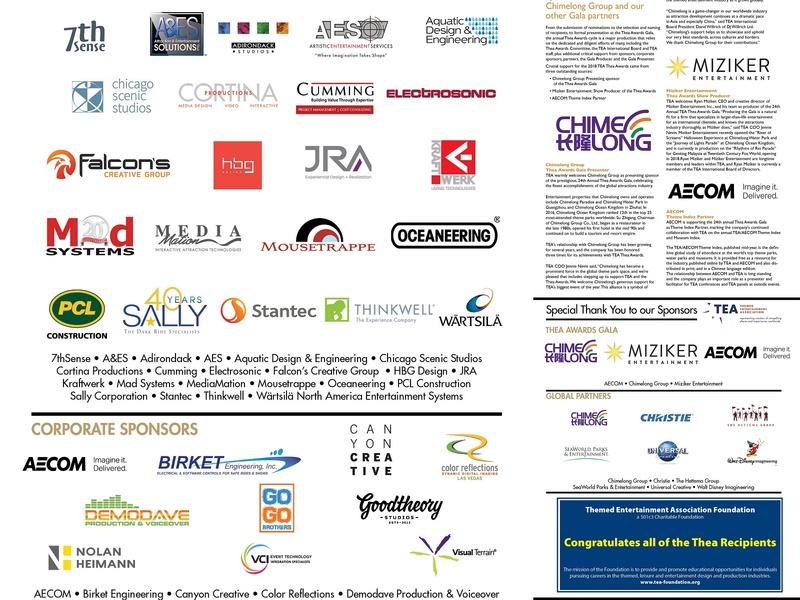 2018 TEA Thea Awards Sponsors - Thank you! 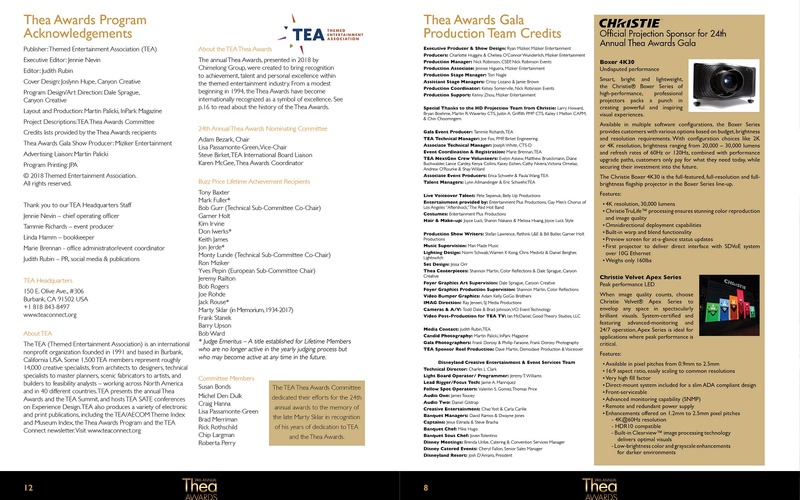 2018 TEA Thea Awards Acknowledgments - Thank you!